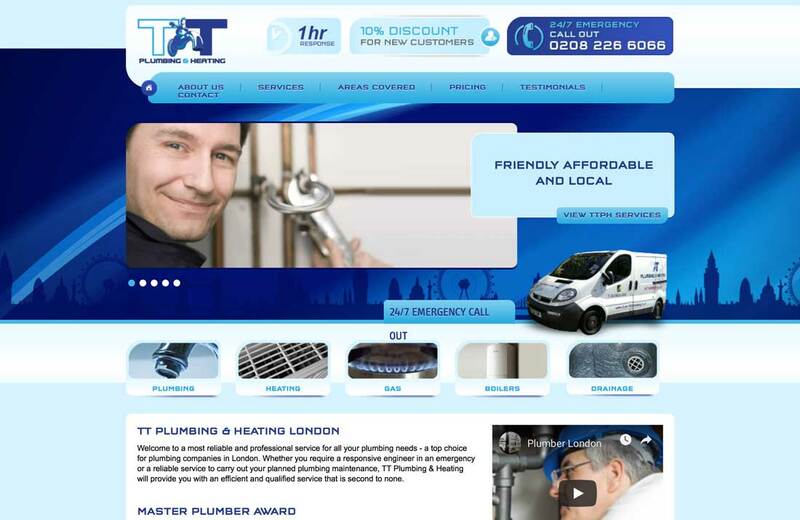 ttplumbingheating.co.uk Are a local independent plumbing company based in London. They have many years of experience with plumbing and their head plumber has recently been awarded with Master Plumber status. Due to the prestige and exclusivity of the award, it gave us a unique opportunity to push the story across multiple media channels, and local news sites. As a local service provider/tradesman, it is important to stand out from the crowd any way you can. We helped TTPH with their SERP visibility, by adding review stars to their search results, displayed in Google. As you can see, a standard google search result is made up of 4 lines. The title or headline in blue, the url in green, and then two lines of description in grey/black. By using the reviews, we get an additional line on the search result, and as the stars are orange, it is much more likely to catch peoples eye when scanning the SERP. It is, of course, helpful that TT Plumbing & Heating have a great track record with reviews. If you are unable to get customers to leave you reviews, you need to think about how and when to ask for them. Going forward, reviews will continue to grow in importance, as we continually need to set ourselves apart from the competition. If you would like us to help you with your stars, then get in touch. We can discuss best practices when begging for reviews 😉 and general reputation management. Online reputation management can be vital for your company, as it becomes ever more important to your customer’s trust and decision making.